A 42 cell custodial suite with ancillary rooms and grey concrete façade around the perimeter. Utilisation of BIM design to achieve the complex radial layout of the custody suite ensured that all individual precast units and units connections were correct, enabling a first time fit on site. High quality grey concrete sandwich panels around the curved perimeter provided an architecturally pleasing finish. The direct decoration standard of finish to concrete within the corridors and the cells removed the need for tiling. Fully constructed in seven weeks with an average number of nine site operatives present per day. PCE Ltd recently provided the custody suite for the new Police Headquarters for Lancashire Constabulary‘s West Division at Blackpool. 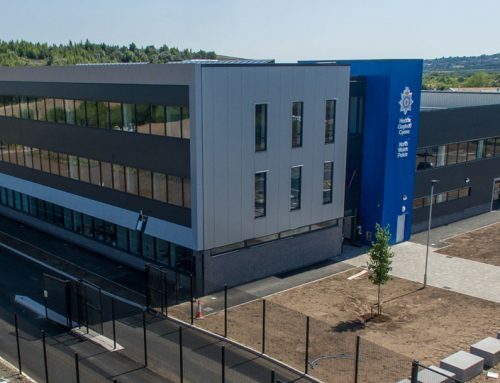 PCE was appointed by main contractor Willmott Dixon as specialist on a design and build basis to provide a single level custody suite building to the rear of the new Lancashire Constabulary West Division headquarters situated on Clifton Road in Blackpool. 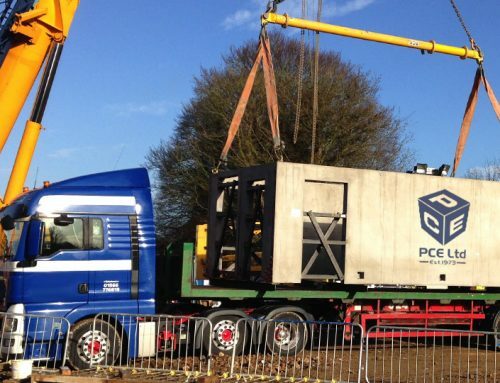 All of the above units were manufactured in precast reinforced concrete offsite to the high quality specifications required by the client and PCE’s own quality processes. A key feature of the erection process is the safe and careful turning of units from their delivery position to that required for installation into the structure (see images above). Production of the precast units began four months after the commencement of the detailed design work. The erection period on site – including finishing – took eight weeks, with the maximum number of PCE staff on site at any time being a mere twelve. Nickie Brown, Managing Director of PCE. The aerial image (above) shows the external 5m high sandwich panels, exercise areas and slabs sitting on the internal walls. A clear line of vision is essential to enable a clear line of vision for all corridors from the charge desk area. The other external views show the type C finished sandwich panels which achieved a U-value of 0.27W/m²K. Window openings were cast in for site fit-out of window units at a later date. The M & E openings were also incorporated into design and manufacture to allow louvres to pass through on the first floor. 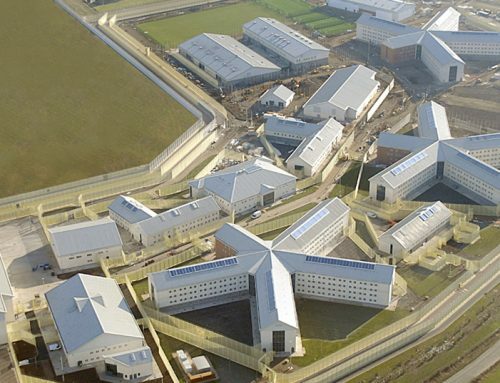 The leading international and interdisciplinary property consultants McBains Cooper provided architectural and engineering design services for Lancashire Constabulary. The new state of the art headquarters replaced the old Bonny Street Police Station.